Today’s article is a Kodak Photo Printer Dock review. This little printer is excellent if you want small, clear photos – perfect for scrapbooking or sticking up on your fridge. Read on to find out what makes this printer so great and why we recommend it as one of our top picks. The Kodak Photo Printer Dock is compact – very compact. Measuring 2.7 x 6.5 x 3.9 inches (6.8 x 16.5 x 10 cm) and weighing 1.7 pounds (0.76 kg) it is highly portable and perfect for travel. Set up is quick and easy – most users are up and running within 15 minutes of unboxing. Prints are one size – 4 x 6 inches – and take about 15 seconds to print. You can connect your phone directly to the printer via the dock – there is no need for a tethering cable. The printer comes with an iOS adaptor for Apple devices. Tablets, iPads and larger devices can be connected with a USB cable via the USB port on the side of the printer. 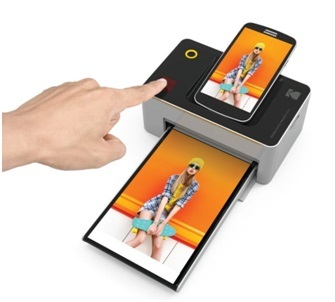 Alternatively, you can connect your device via Wifi, meaning you don’t even need to walk over to the printer to print photos! This printer also doubles as a charger – charging any device directly connected via the dock or USB port – meaning it can charge two devices at the same time. As long as your phone is docked, this printer can also print directly from a thumb drive. The printer transforms your phone into its own control panel to do this – allowing you to navigate and select the files that you want to print. Before being able to print, you will need to download the free Kodak Photo Printer Dock app. This app works as the interface between the printer and your phone’s albums, allowing you to select the photos you want to print. If plain photos aren’t exciting enough for you, the app also gives you the ability to add filters, effects, text and stickers to your photos. You can also crop or draw on the photos before printing. This feature is particularly great as it makes scrapbooks and photo albums more fun and exciting. For a small printer, the quality of the photos is particularly good. The photos are printed in layers of colour. The paper is fed back and forth through the printer as the layers of yellow, magenta and cyan are applied, before a final clear coat to seal everything and provide a glossy finish. This technique is known as D2T2 Thermal Transfer and works by a small thermal printing head within the printer, which deposits different amounts of dye depending on how hot it is. This method is advantageous because the prints are dry and ready to be handled the moment they are finished printing. It also requires less moving parts when compared to an ink jet printer – meaning there is less chance of a fault occurring within the device. The overall effect is sharp, bright and clear images with colours that match those onscreen. 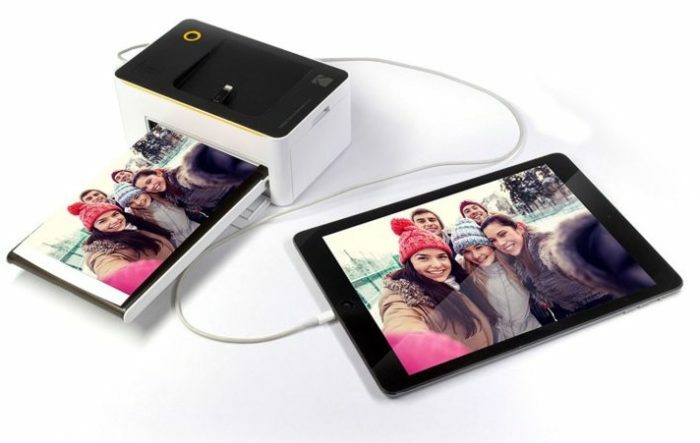 Whilst the Kodak Photo Printer Dock is highly portable, it does need to be plugged into a power source in order to operate. This means that you cannot print in remote areas where there is no access to a power socket. You are limited to only 4 x 6”photos – this printer isn’t suitable for printing panoramas or if you are after a variety of shapes and sizes. Whist the printer itself is relatively cheap to purchase, the cost per print is relatively high. Ink cartridges and paper need to be purchased together in a bundle, and even though there are discounts for buying these in bulk, a single photo works out to cost around 40 cents on average to print. If you only want to print a couple of photos here and there, then this printer is still great because it is cheap to purchase and has excellent quality prints. However, if you are regularly printing photos we would recommend a printer that is more expensive to purchase but has a cheaper cost per print. This will save you money in the long run. 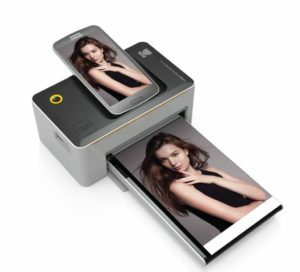 The fun features of the Kodak Printer Dock app, the exceptional quality of the prints and the lightweight portability make this printer one of our top picks. 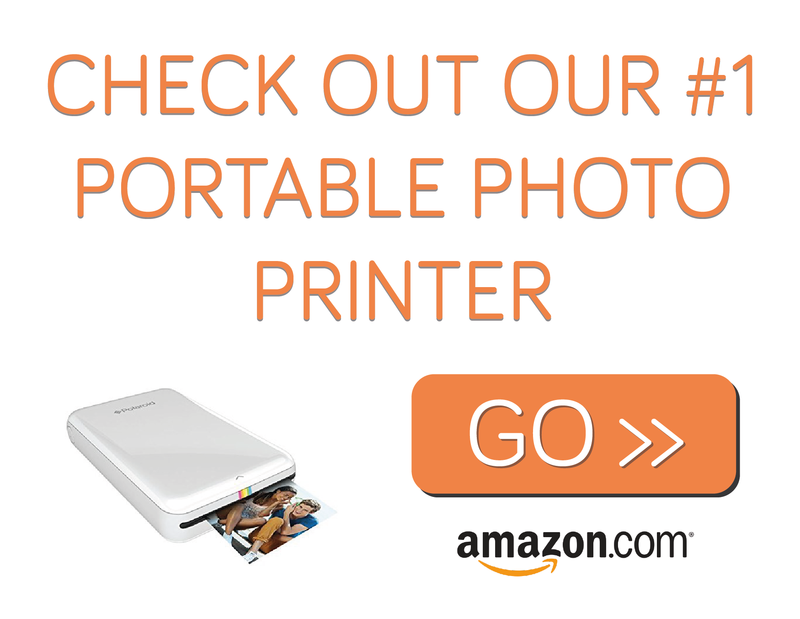 We highly recommend this printer for anyone who is looking for a reliable photo printer for everyday printing.